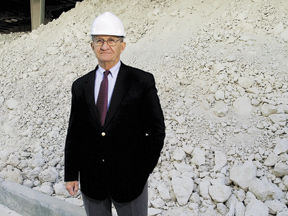 For 50 years the most important industry in Washington County has been kaolin mining. Kaolin, a white, alumina-silicate clay, is found exclusively in the Southeastern United States along the fall line – that geological formation where the piedmont plateau meets the coastal plain – across middle Georgia and into South Carolina. Driving east from Milledgeville into Washington County, the mines are visible off to the left among the pine trees, which represent the area’s other significant industry. But increased competition from Brazil and falling prices have led to a scaling back of the once-flourishing kaolin industry. Fortunately for residents of Washington County, elected officials and business leaders have taken steps – a new industrial park, for one – to entice new industry and new jobs to the area. The county is “centrally located in the middle of nowhere,” says Theo McDonald, president of the Washington County Chamber of Commerce and executive director of the Development Authority of Washington County. It sits between Macon and Augusta, south of I-20 and north of I-16, smack in the middle of the kaolin belt. With four mining and processing plants in operation in Washington County, kaolin’s influence isn’t exactly disappearing. So, what’s happened? Other problems include the discovery of substitutes for the mineral, which is used primarily in coating paper. Competition from Brazil is also driving down the price. Brazil offers quality kaolin, cheap labor and a logistical advantage when shipping to Europe, Archer explains. The kaolin can be loaded directly onto a ship on the Amazon River and taken to Europe. Georgia kaolin must be loaded onto railroad cars or trucks, hauled to Savannah and warehoused before it can be shipped overseas. With the decline in the number of kaolin employees and in mineral output, county, city and business leaders have forged partnerships to further efforts to attract other industry to the area. The longstanding good relationship between the leaders in Washing-ton County and the city of Sandersville, officials say, was critical to development of the new Sandersville-Washington County Research and Industrial Park, jointly owned by the city and county and managed by the Development Authority of Washington County. The 215-acre park and 100,800-square-foot spec building were developed with proceeds from a special purpose local option sales tax (SPLOST), which passed in 2000. The county and city began collecting the tax in 2001; the park and spec building were completed in late 2004. The first tenant, Thomson Plastics, was in place in January 2006. “The spec building is the best thing we could have done,” McDonald says. It was risky, he adds, but if it hadn’t been built, they wouldn’t have attracted the three companies committed to the park. Thomson Plastics produces vending machine parts and supplies parts for Club Car golf carts in Augusta. Thomson now has 80 employees working out of its Sandersville plant. Trojan Batteries, a company relocating to the industrial park from California, provides batteries to Club Car. With the land cleared, construction will soon begin on Trojan’s building, which will ultimately reach 200,000 square feet. By the time Trojan is up and running in late 2007, it anticipates hiring 200 employees, most of them from the surrounding area. The third new tenant, a start-up biodiesel company, will process 60 million gallons of palm oil per year. The venture is just beginning to develop its 20-acre parcel. The site along the Fall Line Freeway was an important factor in Thomson’s locating at the new park. The freeway, which is expected to run eventually from Columbus to Augusta, is complete between San-dersville and Augusta. The industrial park also is served by the Sandersville Railroad, a local shortline freight railroad, and has all the necessary infrastructure in place. Several factors have allowed the area to take advantage of luck, including education and transportation options. With Sandersville Technical College across the street from the industrial park, companies can easily access the Quick Start program, which offers employee training at no cost to new and expanding businesses in Georgia. As for transportation, “Most new industrial sites are within 10 miles of a major interstate,” McDonald says. “Although we don’t have an interstate, we have the Fall Line Freeway.” Local officials will continue to push for the freeway’s completion, he says. The Sandersville Railroad Co. offers another transportation solution to prospects looking at Washington County. Founded in 1893, the shortline freight railroad was instrumental in the decision by kaolin companies to build processing plants in the county. “The railroad grew up with the kaolin industry, fostered the growth of it,” says Ben Tarbutton III, assistant vice president of the Sandersville Railroad. But for the last 10 to 15 years, diversification has been essential. The railroad company owns several industrial facilities along its lines, which has helped to broaden its client base. Rounding out the transportation options, the city and county plan upgrades to Kaolin Field, the local airport. With a new 5,000-foot runway and availability of jet fuel, the airport has been landing more and more jets. The city and county plan to renovate the facilities to accommodate the upscale traffic. First the city is annexing the airport. Then improvements will begin. Plans call for a new terminal with conference rooms that can be made available to executives flying into the area. “This is a big part of our economic development,” Sandersville Mayor Jimmy Andrews says. “We’re not going to run Kaolin Field. We will help supplement funds.” The private airport authority will continue to manage the field. Partnerships between city and county government didn’t begin or end with the decision to jointly tackle economic development. That step was taken after a good working relationship had already been in place for years. “Back in the early 1990s Sandersville needed to get into animal control,” Andrews says. The city hired its first animal control officer, “a woman animal lover and police officer” to handle stray dogs and other animal incidents. The county realized it needed the same services and offered to help finance the office, if the city would run it. The joint program continues today, with two animal control officers serving both city and county. Forward-thinking public officials and business leaders aren’t all Washington County has to offer. Thanks to Scott and Susie Price, both teachers at Washington County High School (WCHS), the area is home to a thriving community theater founded in 1999. In keeping with Price’s goal of offering something for everyone, the Sandersville Community Theatre produces shows with roles for every age. In the past they have performed “Hello, Dolly!” and “The Sound of Music,” among others. The community theater is looking for a permanent home so it can schedule a full season of shows. Because current performances are held in the high school auditorium, the troupe can only stage one show – during the summer, when school is out. “The community loves musicals,” Price says. But he’d love to be able to offer a wider variety of shows. While tourism hasn’t been a big part of Washington County’s economic development plan, Sandersville does boast the antebellum Brown House Museum, which opened in 1999. The structure is located on Silk Stocking Street – a collection of beautifully restored mostly Victorian homes just off the square – so named because affluent ladies would hang their silk stockings over the porch railings advertising their wealth, says Beverly Webb, lifelong resident of Sandersville and a local real estate agent. Built in 1850, and purchased soon after by the Brown family, the Brown House survived the Civil War unscathed because Gen. William T. Sherman used it as his headquarters in November 1864 and even slept in the house – although it was just a nap. The residence sat vacant for 15 years before the Washington County Historical Society purchased it in 1989 with an eye toward opening it as a museum. The museum exhibits several pieces of the Brown family’s furniture, including the sofa Sherman is said to have napped on. Writings from the Brown family detailing Sherman’s visit and information about daily life during the Civil War led to the creation of a video depicting events from the period and starring locals as members of the Brown family, Gen. Sherman and other Civil War soldiers. And hunting has been good to the area, says Webb, a real estate agent with Town & Country Real Estate & Investment Co. “We sell a lot of hunting land to people from Florida to North Georgia.” Sales of land have fallen a bit with the recent real estate market slowdown, she says, but notes that in residential sales, “there’s been a bubble here in our area; it hasn’t burst yet. We’re getting our first condo complex in the county. It’s 10 units, right in town.” By mid-October five of the 10 units had sold and construction had just begun. Commercial property is also selling, Webb says. Her company sold land on Fall Line Freeway for the Days Inn that opened in the summer. Then it sold property across the street for a Mexican restaurant that began construction in the fall. Other chains and businesses are taking notice of the Sandersville area as well, including Wal-Mart, which opened a Supercenter in 2006 on Highway 15, south toward Tennille. “It’s bringing in lots of people from out of the county,” Daniel says. A former Lowe’s distribution center located approximately one mile east of the Sandersville Square has been leased by Meltblown Technologies, a company that developed a process to extrude plastic fiber into mats to absorb oil spills. The company was gearing up in the fall and plans to have 60 employees the first year and 100 within 18 months. “The industry has been fantastic for the community,” McDonald says. But he and other leaders are proving that Washington County isn’t a one-horse town. In fact, McDonald says the area will see a net gain of 400 jobs once the new businesses in the industrial park and Meltblown Technologies are in full swing. From a diversified industrial base to new housing to an influx of restaurants and stores, the county that is “centrally located in the middle of nowhere,” is thriving, thanks in large part to the partnerships and excellent working relationships that have flourished along with the pine forests.